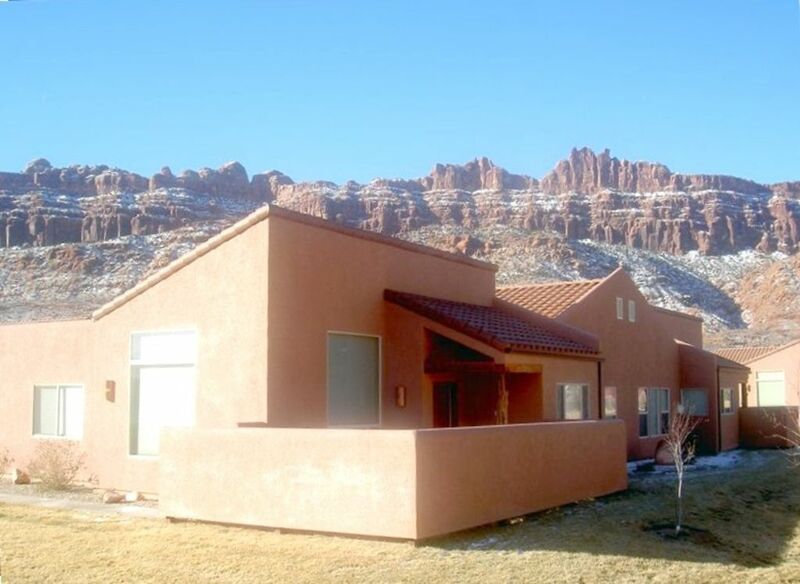 Sweet Moab Condo - Your Adventure Awaits! This Condo is THE ONE! Open floor plan, and location set it apart. Aside from the incredible views and convenient/private location this home has three bedrooms (two with king size beds and one with two Twin Beds) and the sectional couch is also a queen size hide away bed for maximum sleepability! The large dining room table and bar stools can accommodate everyone for dinner. It also has a two car garage for toy storage and a large private patio to relax after your Moab Adventure. The condo has everything you'll need for a home cooked meal including a Weber Gas Grill on the patio. Yes all linens and towels are included. I respond very quickly to inquiries 8am - 6pm MST. For inquiries after 6pm I will respond early the next business day but it will be worth the wait because this place is SWEET! Thanks for checking out our Sweet Moab Condo. We love the place and are sure you will too. We live in Salt Lake City and are very busy like everyone else so we only use the condo a few times a year. We've tried to make the place really nice and affordable so others can enjoy it. We initially purchased a condo in Moab because we race mountain bikes and it's the mountain bike mecca of the world. We can ride here year round! However we also fell in love with the various types of terrain, scenery and recreation options offered by the area. One of the things we love about our condo is how peaceful and quiet the area is. Our kids can ride their bikes everywhere, swim, hike, chase lizards and we can truly relax. We also have a unique picture view of the La Sals Mountains in our large living room window. We're always surprised how well our condo accommodates our family and any guests we bring along. The floor plan is spot on. NO Landline must use cell phone! This is our 3rd or 4th year of staying in this lovely Moab condo, it is clean and always a pleasure for us. It is spacious living area, good size bedrooms & nice bathrooms. A short walk to the pool and neighborhood walking paths. The condo was great. Very clean & had everything we needed. Conveniently located close to town. The beds were amazingly comfortable. We loved it. This is our 4th New Years retreat to Moab in this lovely space. We are frequent visitors to Moab and stay here when ever possible. The space is remarkable, convenient to so may attractions, the condition and upkeep is without compare. We give the property, location and value 5 stars! Everything was wonderful, looking forward to staying again. Four of us spent three wonderful days in Moab at the Rim Village. Spacious and plenty of great views. Destiny was very helpful and responsive. Hate to leave but we will return. Jeff Baumann , Arlington ,Va.
Second time staying here, this location is fabulous. The condo is a great layout, an easy community to navigate, and the views are quite amazing to wake up to. Will be sure to book here on any future Moab trips. Moab is also famous for Mountain Biking, Rafting, Hiking, 4 x 4 Adventures and ATV Trails. Very close to Arches and Canyonland National Parks. Please read attached rental agreement.